Very similar tonalities used this year, as compared to 2017. The major mode gained a little ground this year, chalking one more song, but it’s those sneaky-sultry minor modesthat are still dominating. 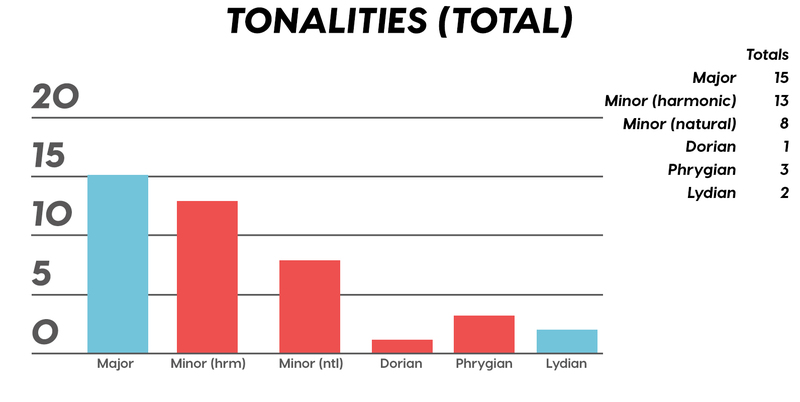 Worth a shout are the upticks in Lydian and Phrygian, and it’s also interesting that harmonic minor scales doubled their representation from four songs to eight. Maybe the V chord is coming back in style after all? Now let’s look at some anomalies for roman numeral chord types used. 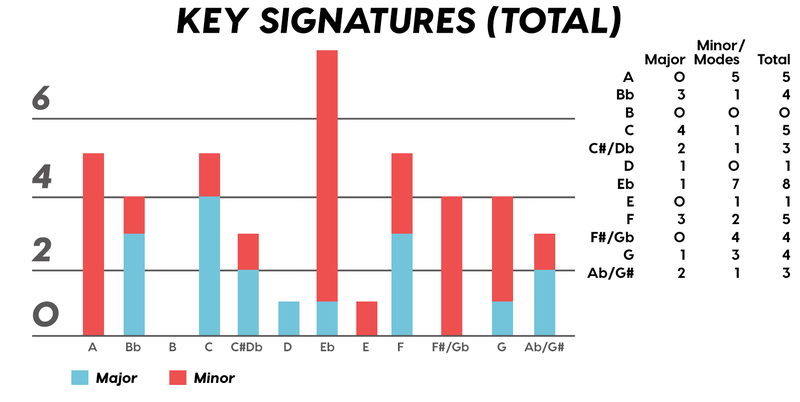 For instance, the iii and♭VII chord types appeared well above and below their average rates, respectively, and both the major and minor tonalities managed to borrow their opposite tonics, so that’s a fun spice you don’t often get to taste. The tone on these loop chords is so low and pillowy, I don’t really know what to call them. I think I’m hearing them as D♭ and Cm. I’m sure the key we’re in is A♭ majorbecause of the melody, but that means it’s a IV and a iii chord — there’s no tonic chord to establish the key, in keeping with the modern anti-establishment trends we’ve been tracking. “Thank U, Next”: The sustain of that dreamy electric piano in this chord loop solidifies the G♭ chord as a G♭M13 and the F chord is an F7(#9) secondary dominant (V/vi )! Then we have a regular B♭m before returning to the tonic — but not so fast! We haven’t really returned home, since it’s a D♭7, another secondary dominant (V/IV) that sends us back to G♭M13. These secondary dominants act like coal nuggets to fuel a perpetual motion chord-loop machine. Form-wise, you could also call the chorusextensions “post-choruses,” but I already used up my “P” for the pre-chorus sections, so I’ll just call these extensions “variations” and be done with it. “Meant to Be”: We’ve got a very cool, non-standard “shuffle treatment” of a chorushere. The chorus itself is AABA, and after the second chorus they chop it up and shuffle it to make a new section that goes BBA, which I’m going to call a modified half-chorus(c2). Then, we have the shortest bridge in history, just two pop-perfect bars of “maybe”s. Next we’ve got a more proper “non-chopped” half-chorus to end it. And we gotta give a shout-out to the inverted V chord they snuck in there with the moving bass line in the chorus. “Happier”: Wait, no… what are you… no! Not the dog, come on, man, not the dog, what are you doing to me, Marshmello? Okay, so here’s a form I’m not adequately equipped to categorize or compare to anything else: what’s stumping me is what to do with the three-bar space in between the pre-chorus and the solid chorus/refrain that’s introduced at the beginning. For now, I’m lumping it in with the chorus as part of achorus variation. But you could also think of it as an extended part of the pre-chorus, especially as its lyric is taken from it. Or, I guess we could even call it an “interlude.” It’s slippery. I have to highlight the half-bridge that ends the song — you almost never see half-bridges. “Look Alive”: Aaand we’ve got more Drake. Aaand we’ve also got another somewhat subjective tonality. What we’ve got is three intervals, A and E (an A5 chord), A and D(D5/A), and B♭ and D (B♭ no fifth), and a bass line that adds an F in there (for a♭VI chord, arguably). There’s also no singing to help us establish tonality, and so I first heard it in D minor, but after repeated listening, I realized it was just my brain filling in gaps to meet my tonal bias. It would actually be truer to classify this as A Phrygian because with the A F D B♭ bass line, and without any concrete triads, it’s best to leave it up to the musical scale that matches the sound, and the Phrygian scale here clicks better than anything else. “No Brainer”: So I’m not really hearing, like, “chords” here — just the bass line with the funky leading tone, the ping-riff thing, and the baby-robot notes. I mean, together they do sort of make “chords,” but it’s pretty subjective. I’ll tell you what, though: I’m not building chords off the fifth and sixth notes of the bass line. I just don’t hear vi and Vchords like I’m hearing the other chords I can pick out of this loop soup.